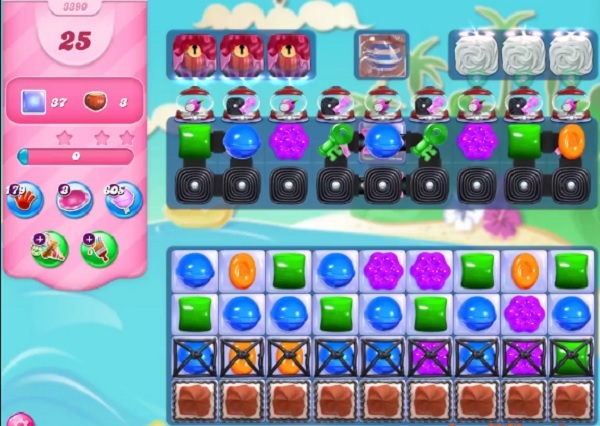 Clear all 37 jellies, bring dawn all ingredients and reach 20,000 points to complete the level. I only have 15moves. Please help. I wrote above yesterday that I only had 15 moves instead of the 25 on demo and couldn’t get near it. Today I now have 13 moves , How does that work ? Have 16 moves.Would appreciate your help.Thanks for listening. Can’t be done! How many different ways do we have to complain before CC corrects its incompetency? Shame on u CC! Unfair and cruel. It appears that over 90% of your levels are flawed. Why can’t u fix the fixable? Need more moves and a very very lucky board. Shame on u CC. So very sad! This is insane! It’s absolutely impossible. There is no way to complete this unfair level with 16 moves. This is another new low for CC. Congrats to CC for being one of the worst run organizations. Shame on u CC! So pitiful. The worst. Why don’t u care about your players of this game CC? This level is impossible. No one can complete this level with only16 moves. Need more moves and a very very lucky board. Shame on u CC! Why can’t u fix this? U just don’t care! Why don’t u receive compliments about how u run this game? Answer: u run this game in the most dismal way. This is insane!!!!! WHY CC? Need more moves and a very very very very very very very very lucky board! This can’t be done, no matter what u do CC without giving a lot more moves and a very very lucky board. What will it take to fix this unfair, cruel, insane, pathetic, disgusting and unbeatable Level? Can’t be done. Impossible! Unbeatable! Insane! Cruel! Shameful! Disappointing! Beyond CC’s abilities to fix this mess! Total incompetence! U are way over your head in running this game! Why can’t u act positively to our complaints and fix it? This is humanly impossible. No way, no how can this level be completed. WHY CAN’T U FIX THIS???????? U have reached the unreachable low in how u run this game. Congrats!!! Well deserved. SHAME ON U CC!!!!!! Very embarrassing!!! Very sad!!!! Cruel!!! Unfair!!!! Impossible!!!! Clueless!!!! Incompetent!!!! Need a whole lot more moves!!! This is way over your head!! U can’t fix the fixable!!! Shameful!!! Amazingly incompetent!!! Can’t be done!!! Need 2 color bombs next to each other a few times to have a chance. Can’t be done without more moves and a very very lucky board. What is your problem CC? Fix this simple problem. How many times does it take to get more moves to finish this level? Can’t be done without it. Need a whole lot more moves!!! When will u fix this problem??? Impossible. Very cruel on your part CC! Shame on u!! I don’t understand why u can’t fix this. Need more MOVES! More moves!!! More moves!!!! More moves!!!! More moves!!!! More moves!!!! More moves!!!! More moves!!! More moves!!!! And a very very lucky board! Need more moves now!!! Impossible!!! Shame on u CC!!! U just don’t care about us playing a fair game! Very shameful!!! A new low!! Need more moves. Can’t be done without it!!! Only way to beat this level is with more moves. No other way. Fix it. Simply impossible. This is so simple to fix! Need more moves. Nothing less will do. CRUEL and UNFAIR!!!! Simple solution. Need more moves!!!! Can’t be done! Need more moves ASAP! This can’t be done. Impossible. Why can’t u fix this? This is mind numbing. This is beyond pathetic! More moves mandatory! No other way to complete this ridiculously unfair and cruel level. Why can’t u add moves to this level? So sad! There is no way to complete this level. It needs to be removed. This game used to be fun. Now, it’s beyond frustrating and terrible. All u have to do is add at least 7 moves. Only have 15 moves. This example shows 25. How come we don’t get 25 moves. I only have 16 moves. That is a significant disadvantage compared to 25 moves stayed here. PLEASE SEND A “MIRACLE BOARD” TO HELP ME COMPLETE THIS LEVEL. THANK YOY. This is a second request. For 4 days I Havre continued to play this level many, many, many times with 16 moves. I have used boosters when available…not willing to use any more. They don’t help. With 16 moves you are either able to remove key locks (maybe) OR jellies. OR the 3 icings OR the striped candy above (if there isn’t a licorice in the way). It is not inmpossible to complete this level with 16 moves. No matter what you do, the “helps” NEVER help. They always adjust to being one move away from helping. This is a hateful level obviously being controlled. I have had explosive boards which don’t hit the needed targets. I ask, again, for a much needed “MIRACLE BOARD” or whatever help you can PLEASE SEND SOON. I AM AT THE END OF MY PATIENCE. THANK YOU FOR LISTENING. 14 moves instead of 25, impossible but at least interesting to play for a few days, then I think it’s enough. You don’t care about your players, how corrupt your games are – just want to get our money. Maybe you need some new programmers, maybe you need to go through your tips game by game and see all of the discrepancies that we see. Please fix this.